Before and during the First World War, the French Navy (Marine Nationale) built, ordered or designed four classes of dreadnoughts. Though the latter two looked impressive at first glance, none of these were particularly good fighting ships. Rejecting outside influences, the French went their own way and ended up a generation behind everyone else. Those older ships show up in modernized form in Second Great War at Sea: The Cruel Sea, but there’s only so much modernization can do to overcome poor design. When the French began work on a new generation of fast battleships, they once again went their own way in terms of design, and while they still lagged behind the world standard, this time the French managed to create much more effective warships. Partly that had to do with the design team. Where the early French dreadnoughts had been drafted by young naval architects without actual experience at sea, in the 1930’s French warship design was overseen by Vice Admiral Georges Durand-Viel, who had studied naval architecture when already in his 30’s (among other engineering subjects), yet also commanded a series of warships including the dreadnought Provence. 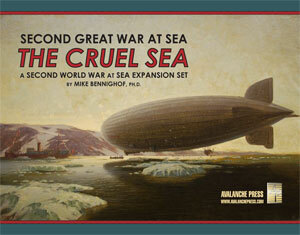 He had drafted a proposed battle cruiser for the Naval War College in 1914. Despite the destruction of German naval power after the Great War, Durand-Viel believed that France would be out-numbered at sea in a future war. In answer, he sought ships of high speed able to act against enemy commerce in a Force de Raid with the firepower to destroy convoy escorts and enemy raiders on a similar mission. He personally prepared the sketches for the battle cruiser Dunkerque, intended as a counter to the German commerce-raiding armored cruisers of the Deutschland class as well the old Italian battleships of the Conte di Cavour and Andrea Doria classes. Dunkerque carried eight 330mm (13-inch) guns in two quadruple turrets, both of them forward. That arrangement allowed a smaller armored citadel, but also grouped the main armament close together to improve gunnery. Compared to earlier French battleships, Dunkerque and her near-sister Strasbourg (built with heavier armor) finally adopted many state-of-the-art principles. They had all-or-nothing armor, protecting only their vital areas (a scheme adopted by the Americans nearly 20 years earlier) and good underwater protection. Their power plants featured high-pressure boilers and geared turbines, their secondary and anti-aircraft armament was entirely mounted in turrets, and they were designed from the start to operate aircraft. The Great Depression hit France very hard, and did so later than most other countries. French shipyards proved unable to complete the new battle cruisers very quickly; Dunkerque took five and a half years to complete and Strasbourg four and a half. They had brief and not very successful careers and were scuttled by their crews in November 1942. While successfully meeting their design requirements, the two battle cruisers fell short as combat ships. They were fast, but their 13-inch guns were unable to penetrate the armor of most true battleships while their own armor could not keep out heavy shells. They had been designed to defeat two classes of potential opponents (the German armored cruisers and old Italian battleships) and on paper at least could do so, and the German battle cruisers Scharnhorst and Gneisenau as well. But they were no substitute for actual battleships. The Washington naval limitations agreements would have allowed the French to build three of these battle cruisers, but after authorizing Strasbourg the Marine Nationale preferred to move on to a real fast battleship. We included the third ship of the class in The Cruel Sea, even though the French Navy never asked for her – in our alternative history, the agreements give them the incentive to do so and she’s laid down along with her sisters somewhat earlier than actually occurred (the design phase, as well as the construction phase, took a great deal longer than in most other countries). Instead of a third battle cruiser, the Marine Nationale prepared the Richelieu class fast battleships. Durand-Viel also oversaw their design, though in an administrative role rather than with the hands-on work he had put in on the Dunkerque project. Richelieu would follow the pattern set by Dunkerque, with all of her armament forward in two quadruple turrets for her eight 380mm (15-inch) guns. The quadruple turrets saved considerable weight in comparison to dual or triple mounts, but they could not accommodate larger guns without pushing the ship over her treaty-limited maximum displacement of 35,000 tons. 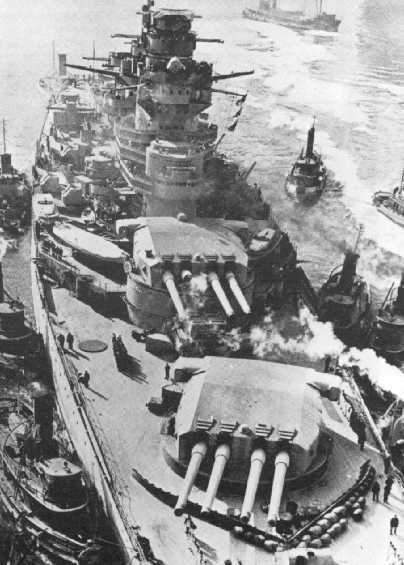 As with all previous French designs for quadruple-gun turrets, these were actually two gunhouses mounted on a single turntable and barbette, each with two guns, with an armored screen dividing them. The Richelieu design placed the guns in paired cradles, and experience would eventually show that they had been mounted so close together that the guns of one pair could not be fired simultaneously, or the wake of one shells would interfere with the flight of the other, resulting in broad dispersal patterns. After the war, the center guns would be fitted with a delay coil which caused them to fire .06 seconds after the outer guns; the ships’ new fire-control radar required full salvos to be fired for maximum effectiveness. The Model 1935 guns themselves were not particularly good weapons, comparing poorly to the contemporary Ansaldo 15-inch guns fitted on the new Italian Littorio-class ships. They were heavy, complex to manufacture with many separate parts, and had a slow rate of fire. They also had a propensity to hang fire; three of Richelieu’s eight guns were destroyed by such accidents during the brief September 1940 clash with the British at Dakar (check out the photo above). The Model 1935 had a bore slightly smaller than 15 inches; ammunition manufactured for other 15-inch guns would not fit the breach. Richelieu introduced a new secondary battery, nine 152mm (6-inch) guns in three triple turrets sited aft. This was a nominally dual-purpose mount allowing high-angle anti-aircraft fire but in practice their rate of fire, training and elevation were all too slow to effectively engage aerial targets. Richelieu had barbettes fitted for two more turrets forward on either side of the bridge, but these were replaced by lighter anti-aircraft weapons during construction. A dozen 100mm (3.9-inch) guns in six dual mounts provided medium anti-aircraft cover and an array of 37mm guns were carried as well, later replaced by Bofors 40mm guns. Like Dunkerque, Richelieu featured all-or-nothing armor; her long bow section was unarmored except for a thin armored deck. Her belt armor was slightly thinner than that of other battleships of her time, but unlike those ships Richelieu’s armor was sloped to hopefully provide relatively better protection. She had a massive power plant producing 150,000 horsepower – the largest fitted in a battleship to date – good for 30 knots’ top speed, not quite as much as the Italian Littorio made on less power. While less relatively backward than earlier French designs, Richelieu still lagged behind foreign ships. She was not as good a fighting ship as Littorio, which carried one more 15-inch gun with better speed and protection (although the Italians, unlike the French, cheated considerably on the 35,000-ton limit). The Marine Nationale laid down Richelieu and her sister, Jean Bart, in 1935 and 1936. Another pair would be ordered in 1938 to be built in the same graving docks; France lacked the capacity to build many heavy ships at the same time and had laid down a pair of aircraft carriers on the slipways where Dunkerque and Strasbourg were built. The third ship would have been slightly modified, and the fourth considerably modified with her turrets sited fore and aft rather than both of them forward. Richelieu and Jean Bart don’t appear in The Cruel Sea; they’re found in La Regia Marina. The two originally projected sisters built to the Richelieu design appear, here named Clemenceau (as planned) and Charlemagne (not as planned – the fourth would have been Gascoigne). The re-designed Gascoigne leads her own class of fast battleship, and we’ll look at her next time.